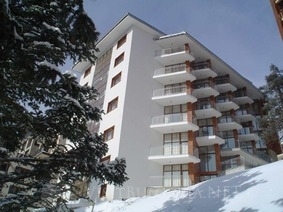 Dafovska Hotel in Pamporovo Ski Resort in Bulgaria - bookings and reservations. 10 % discount until 10 Nov 2016! Location: Hotel Dafovska is located in the center Of Rhodope’s pearl - Pamporovo resort. The wonderful scenery from the rooms towards Snezhanka peak, the ski slopes and Rhodope mountain make your stay an incredible vacation. Owner of Dafovska hotel is the most successful Bulgarian winter athlete - the Olympic winner in Biathlon from OWG Nagano '98 Ekaterina Dafovska. Accommodation: Dafovska Hotel offers to its guests 34 double rooms, 19 of them with extra bed, 10 apartments with living room and bedroom - convenient for 4-people families. They are supplied with cable TV, mini bar, wireless internet access, phone and daily maid service. The Dafovska brand is known for 15 years among the world ski elite with the won medals, world classification and titles in different fields of sport. Facilities: Dafovska Hotel offers lobby bar, restaurant, sauna, steam cabin, Jacuzzi, and beautiful view to the ski runs. The restaurant can seat up to 60 guests. It serves international, as well as many traditional specialties. Lounge bar offers various snacks and drinks.